A number of ornament prints in the V&A collection are designs for cartouches. A cartouche is an elaborate, often scrolled, framing device that quickly became an integral ornamental feature from the 16th century onwards. It has been suggested that the cartouche developed from the flattened oval shape used to highlight the names of royalty in Ancient Egyptian Hieroglyphs. Henceforth the cartouche form has surrounded anything from important messages, coats of arms and even landscape and genre paintings in architecture and the decorative arts. Most cartouche designs in the engraved ornament collection have blank centres. This would allow the craftsman using the design at a future date to embelish it with appropriate motif or coat of arms according to the client’s wishes. A highly ornamental object, the cartouche has always reflected changing fashions and tastes. Designs for cartouches in the V&A collection include examples that chart stylistic changes from renaissance order and baroque flourish, to neo-classical austerity. This early etching was produced between 1520 and 1530 by an anonymous Italian printmaker (V&A Museum Number 19026). Here two cartouches form part of a decorative scheme in the grotesque style. The grotesque derived from Ancient Roman decorations rediscovered buried underground in Rome at the end of the fifteenth century and became extremely popular in the sixteenth century. This print may have been used for the decorative scheme of a painted wall or carved sculpted panel. Here the cartouches are part of a balanced composition and neither dominate nor get lost in the surrounding scrolls, gorgons and Sphinxes. This cartouche, first published by the Flemish printmaker Hans Vedreman de Vries in 1569 exemplifies the mannerist style of the mid sixteenth century (Museum Number E.1413-1923). It is extremely ornate and intricate, combining satyrs, nymphs and dogs within a strapwork frame. 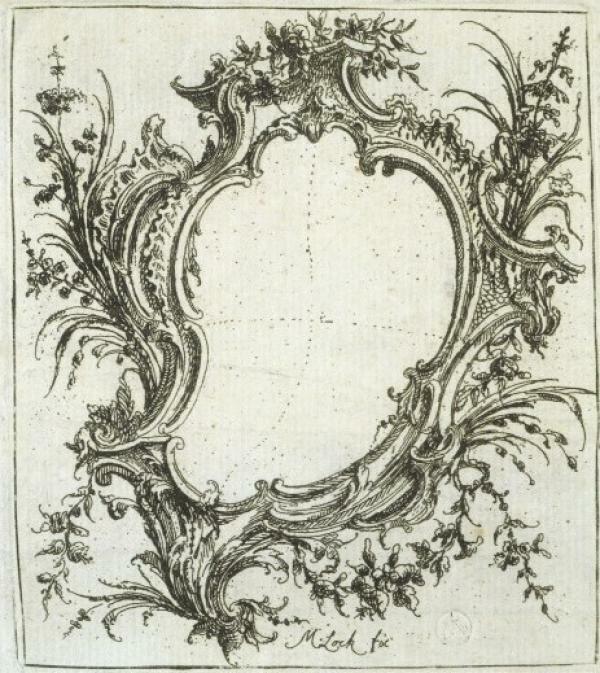 The complex repeating patterns of the frame are contrasted against the black ground of the print. 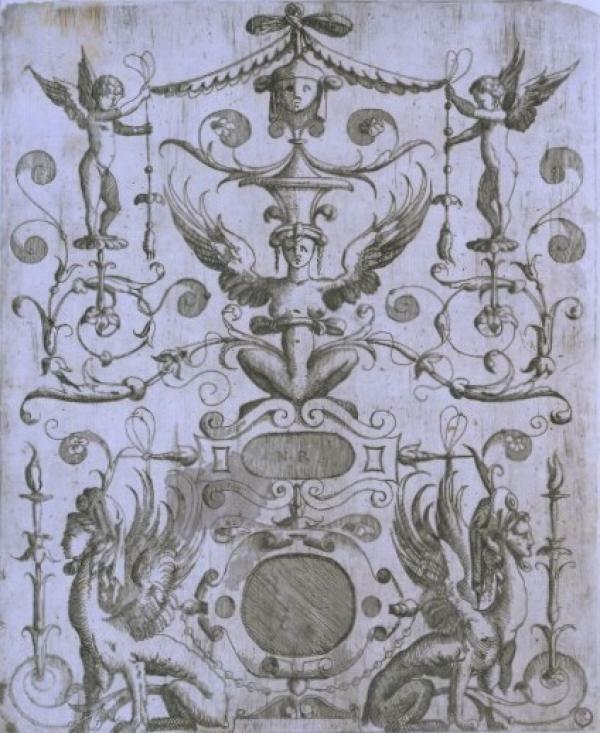 Dating from 1766, almost two centuries later than the cartouche of of Hans Vedreman de Vries, this design was engraved by the Italian Dionisio Valesi after Gaetano Ottani (museum no. 29850.9). It was first published in the book Libro Primo Di Cartelli. Ottani’s design is in the dramatic Baroque style which had come to dominate European ornament since the beginning of the seventeenth century. Unlike the Renaissance examples above, this cartouche is assymetrical. , The curved, flowing lines of the scrolled forms, typical of Baroque design, add movement to this design. The shield is surrounded by classical ruins, flags and props to create a somewhat dramatic setting. Ottani also worked as a mural and theatrical painter, which could explain this grandiose presentation of this cartouche. During the 17th and 18th century ornamental forms became more fluid as printmakers looked to natural forms for inspiration. The human body, animals and plants were absorbed into cartouche designs and often abstracted and distorted beyond recognition. 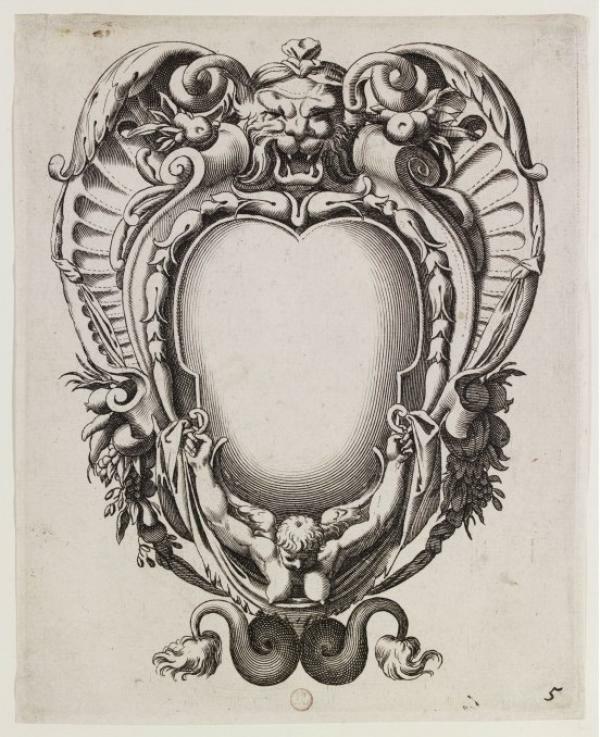 This is clearly seen in this cartouche from 1671, designed by Federico Zuccaro and engraved by Robert White (V&A Museum Number E.2135-1908), which was first published in France. A contorted human figure supports the bulbous blank centre, which is surrounded by abstracted leaves and flowers and crowned with a roaring lion. This cartouche hints at the auricular style; based upon the distortion and manipulation of the human body and other natural forms, often resembling the human ear – from which it derives its name. 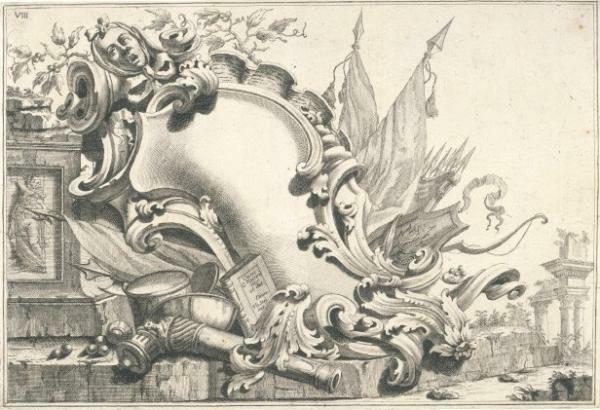 A good example of a cartouche design in the Rococo style is this etching from a book of shields designed by Matthias Locke and printed in Paris in 1801 (Museum Number 29564:122). Here natural forms are combined in a more delicate style than the previous Baroque example. This lightness of representation is partly achieved through the use of etching which allows the printmaker a more fluid and freer movement. This print was published in a volume of designs for cartouches and could have been customized by craftsmen according to their client’s wishes. An ornamental form with its origins in Ancient Egypt, the cartouche has been represented in ornament engravings since the Renaissance. The cartouche has remained an extremely popular type of ornament since these early beginnings. Its design and ornament have evolved alongside contemporary styles and tastes. Intended as designs for decorative objects, perhaps it is no surprise that they often reflect changing trends in fashion. 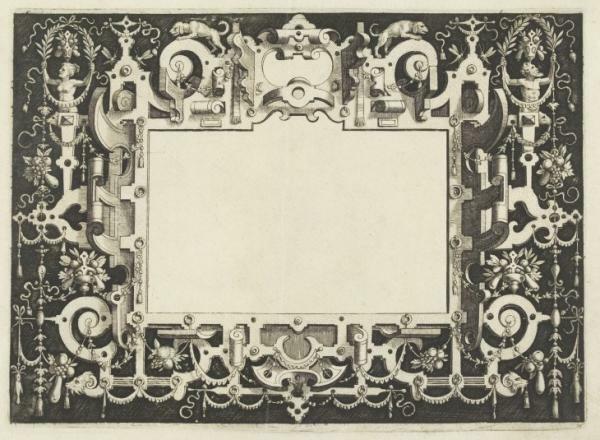 I am interested in the cartouches used by garden designers such as Charles Bridgeman (1685 – 1738), Richard Woods (1715 – 1793) and Lancelot Brown, in the first part of the eighteenth century, on their plans for gardens. These appear to be hand drawn individually, rather than engraved, and do not seem to be on every design any of the above designers produced. I am wondering whether you could point me in the direction of any publications which might deal with these cartouches or whether you have written anything yourself on the subject?